For years we have been told that the Earth’s tilt and the associated changes in incoming solar radiation are the cause of the seasons. Scientists have claimed that it is “settled science” that during spring, the day length increases and the sun gets higher in the sky at noon. 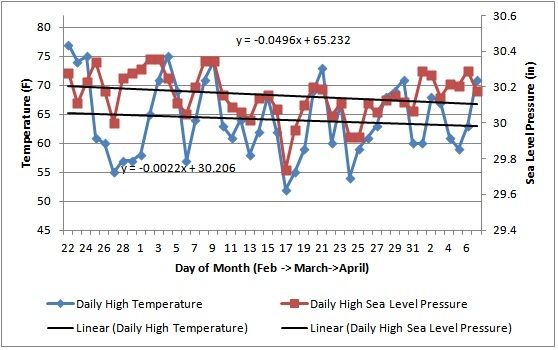 According to the theory, this should cause the Northern Hemisphere to warm from Feburary through April. However, if this science is so “settled”, then why is it easily refuted with empirical evidence? I live in San Jose, California. 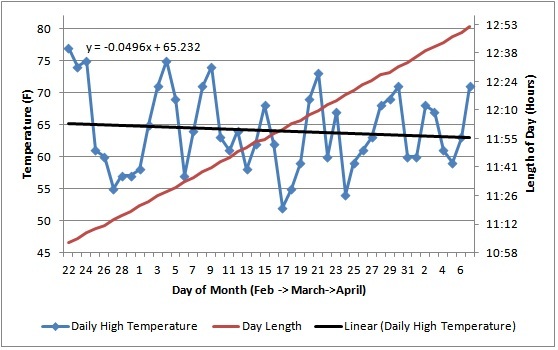 The blue curve in figure 1 shows the daily high temperature that we experienced between February 22nd and April 7th. I have also plotted the amount of daylight for each date in question. Notice that we experienced an overall downward trend in temperature over this time period while the length of daylight steadily increased. This is precisely the opposite of what the ’tilt theory’ of seasons claims. The data proves the theory invalid! ***People with some knowledge of meteorology and the Earth’s seasons will find the above argument ridiculous. However, if there was some political benefit from confusing the issue of why the Earth experiences seasons, I am almost certain that you would see arguments like this all over the blogosphere. 1) In order to see the effect of the Earth’s tilt on San Jose weather; you need to investigate a time period longer than ~6 weeks. To see when the signal becomes apparent through the weather noise see this graph.